For these medieval tours, either on right or left bank, it is really nice starting in the heart of Ile de la Cité with the most magnificent medieval monument: cathedral Notre-Dame. 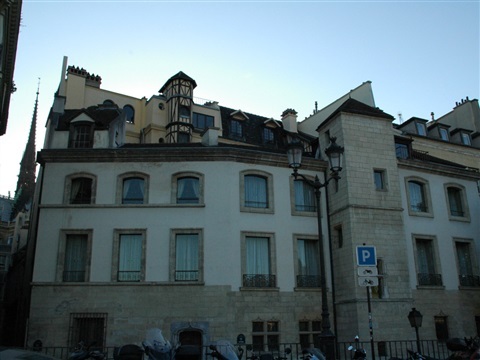 From the cathedral square, we will go along its left side on rue du Cloître-Notre-Dame. We will admire its gargoyles and statues and also an old canon’s house. 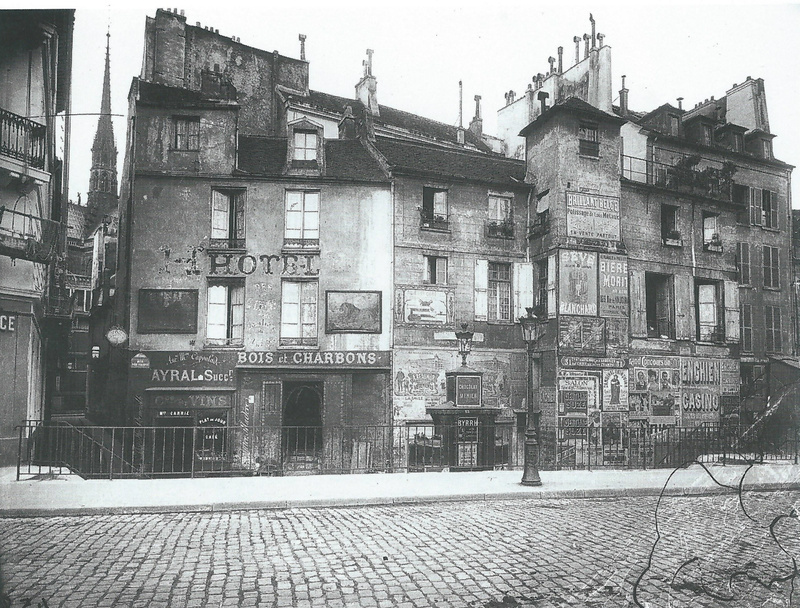 Then, we will turn left on Quai aux Fleurs, then we will stop rue des Ursins at the corner of rue des Chantres. If we continue the tour on the right bank, we will walk towards Ile Saint-Louis where we will take Louis-Philippe Bridge which will take us in the Marais district. If instead, we continue the tour on the left bank, we will keep on Quai aux Fleurs, cross the Flower Market, arrive in front of the church Sainte-Chapelle. This Gothic masterpiece was ordered by King Saint-Louis to the architect Pierre de Montreuil in order to house some fragments of the Holy Cross and the crown of thorns. 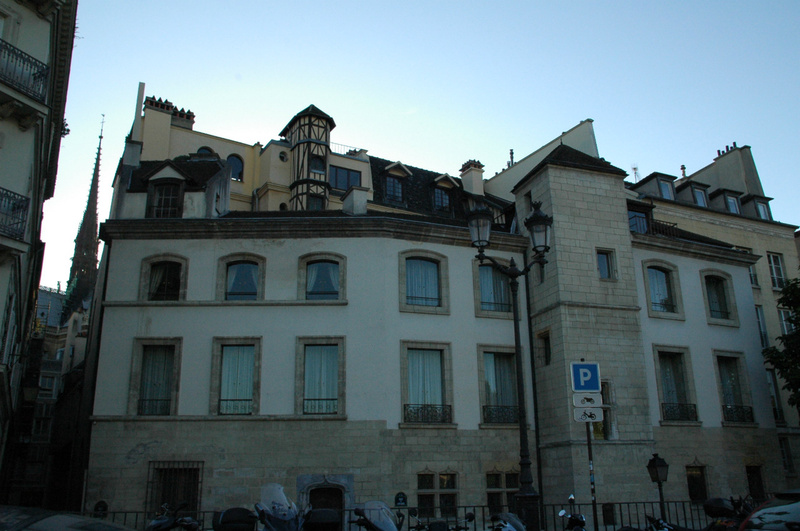 Then, we will walk towards quai de l’horloge where we will stop at the corner to see the oldest public Parisian clock (1371). At the top of the tower, there is a bell which replaced an old one, destroyed during the French Revolution. Ringing this bell together with the ones at the church of Saint-Germain-l’Auxerrois, near the Louvre was the signal to launch the St. Bartholomew's Day massacre in the night of 23–24 August 1572, which was a major turning point in the French War of Religion. Then, we walk along the Conciergerie and its medieval towers : Tour Cesar, Tour d’Argent and Tour Bonbec, the oldest. Here, the name “bonbec” means good beak and refers to the torture room to make prisoners talk. The Gothic novel written by Victor Hugo generated broad interest in the cathedral which was then in a very poor condition and largely contributed to major renovations led in the 19th century by a brilliant thirty years old architect: Eugène Viollet-le-Duc. The degradation caused by men that Victor Hugo refers to, are for example the ones made mainly during the 18th century: hence, the replacement of the medieval Gothic altar with a new one ordered by Louis XIV, though splendid but also awkwardly suited to a 12th century church; the destruction of the 13th century stained glass panels replaced in 1752 by white glass; the enlargement of the central portal by Soufflot in 1771. Many outdoor sculptures, damaged by time had been already been removed when the French Revolution finished the degradation. The statues of the biblical kings of Judah, erroneously thought to be French kings were beheaded by the revolutionary people. Fragments of these statues were found by chance a long time after, in 1977 when works were done in a private mansion, 20 rue de la Chaussée d'Antin. The statues that can be seen today on the front of the church, like this monumental statue of the Virgin, were completely redesigned by Viollet-le-Duc who took inspiration from other cathedrals like the ones of Reims and Amiens. Portals like the Virgin door are covered with elaborate hinges admired since the time of their creation. The perfection of their design made people even think that the locksmith Biscornette was helped by the devil. 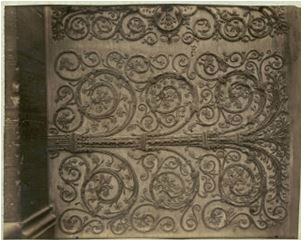 This splendid wrought iron work was destroyed when a new door was built in 1771 by Soufflot. The ones that we can see today were done by Pierre Boulanger, a wrought iron craftsman directed by Viollet-le-Duc who succeeded in making them almost similar to the medieval ones. From the cathedral square, we are now walking along the left northern side, rue du Cloître-Notre-Dame. Let's admire the Portal of the Cloister, built around 1250 by Jean de Chelles. Standing in its center, the delicate Virgin Mother is a genuine 13th century statue, a very scarce remnant of the destroyed medieval statuary. However, its broken child had not been replaced. 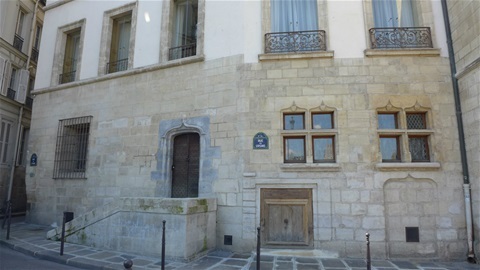 A little bit further, let's stop in front the small red door; the tympanum above the door represents king Saint-Louis and his wife Marguerite de Provence praying Jesus and the Virgin in the center. This door was used by the canons as a direct connection between the cloister and the cathedral. In the medieval times, there was no street where we are. It was an enclosed area with houses and gardens where the canons were living. There was also a very famous monastic school teaching Grammar, Rhetoric, Arithmetic, Astrology and Music. This school closed in 1200 when the University la Sorbonne was created by Philip II, known as Philip Augustus. 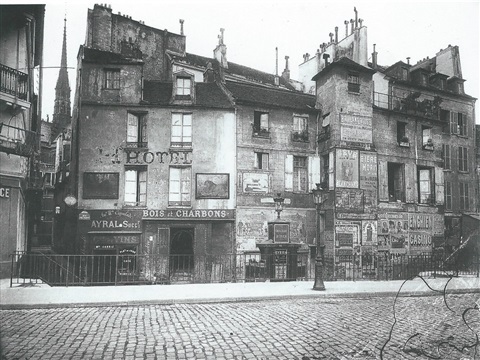 In the middle of Souvenirs shops, we can still see at 18 rue du Cloître-Notre-Dame, an old Canon house, saved from the destruction of old houses led by Haussmann.